Last year's peak summer box office season wound down with Tunnel, a disaster film from A Hard Day (2014) director Kim Seong-hun. Featuring superstars Ha Jung-woo and Doona Bae in a powerful tale combining humanity and social commentary, this big-budget affair executes a effective two-handed play by suffusing its narrative with obvious melodramatic hooks while maintaining a restrained, clear focus throughout. Ha plays Jung-soo, a car salesman heading home with a cake for his daughter's birthday. When a tunnel he drives through collapses around him he must fight to stay alive long enough for a rescue team to get to him. A relatively simple rescue operation becomes an ordeal when incompetence and government interference slow down the process. Unlike other recent Korean disaster films, such as Haeundae (2009), Deranged (2012) or The Flu (2013), which spend most of their first acts introducing us to characters before raising the stakes, Tunnel wastes no time in setting up its premise, when it strands its main character well before the ten minute mark. Through a quiet scene at a gas station and a few calls as he drives, we immediately get a feel for Jung-soo in those opening minutes but the film quickly pivots as it becomes more concerned with setting up the tone of the lengthy and disastrous rescue operation that will play out over the course of the narrative. When Jung-soo makes his initial call for a rescue, the blasé attitude of the disinterested emergency phone operator strikes a balance of disbelief and nervous humor which carries throughout the film. Tunnel is based on a 2013 novel by So Won-jae but one can clearly feel that the story has been reworked to reflect concerns over safety and the government's handling of national incidents in the wake of the Sewol Ferry Incident. In an obvious dig at the sitting Korean president, Kim Hae-sook appears briefly as a national assemblywoman more concerned with photo ops than Jung-soo's safety. Other parallels with the self-serving behavior of officials and mindless hive activities of the media pepper the narrative but director Kim is mindful of the broad audience which a film like this needs and is careful not to take things too far. With ample charm, Ha is an engaging and charismatic lead as he carries the many single-protagonist scenes in the story. But if anything his character is almost too much of a nice guy and the film encounters some trouble when he discovers another female survivor in the tunnel. His actions toward her are selfless while she is portrayed as more of a nuisance and the rescue operation outside never refers to her. Despite limited screen time in a role that largely consists of talking on the phone and looking worried as she trots around the rescue site, the best thing Tunnel has going for it is a terrific and understated performance from Doona Bae. Her powerful turn gives the film its best scene in a tearful radio address than in any other hands would likely have turned into lachrymose histrionics. The ever reliable Oh Dal-su, playing the manager of the rescue site, becomes the conduit of our frustration as he wrings out palpable exasperation from a character whose earnest attempts are foiled at every turn. 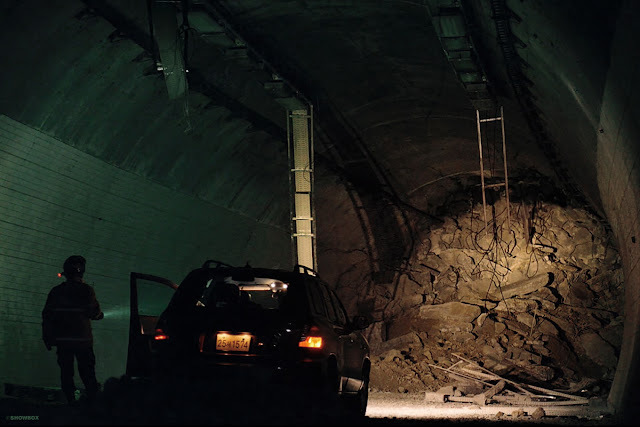 Though not without its own minor pacing issues, Tunnel proves to be Kim's most balanced work following the uneven How the Lack of Love Affects Two Men (2006) and the propulsive A Hard Day, which kicked off with one of the best opening acts in recent memory but build on it in a conventional climax. Creating a claustrophobic feel through strong lensing, production and sound design, Tunnel elevates its message through sensory thrills and thankfully avoids wearing out its welcome by dispensing with the false endings that plague so many four-quadrant Korean titles. In a summer that has been dominated by a zombie apocalypse and the Korean War, the relatively quaint tale of (mostly) one man's struggle in a collapsed tunnel proves to be one of the season's most thrilling offerings.